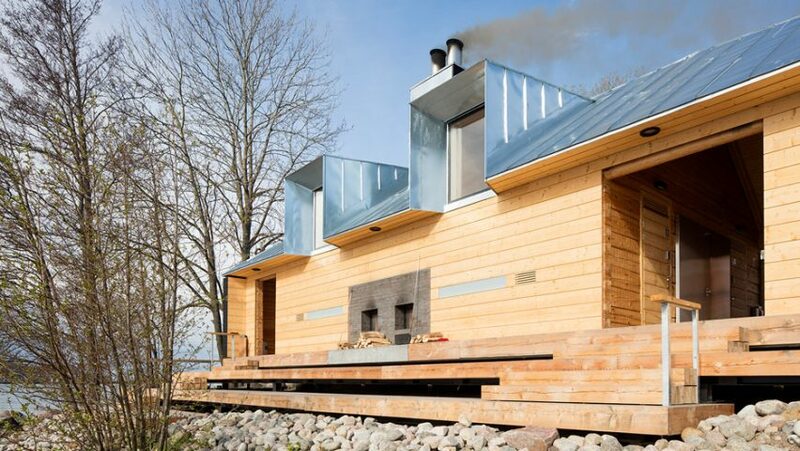 Finnish architecture office OOPEAA has completed a log cabin-style sauna on an island in Helsinki's archipelago that is topped with a zinc roof incorporating dormer windows. 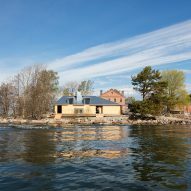 OOPEAA principal Anssi Lassila designed the Lonna Sauna for the Governing Body of Suomenlinna, which oversees activities on a cluster of islands that once formed a sea fortress at the entrance to Helsinki. The sauna sits on Lonna island, which was previously occupied by the military and is situated close to the larger island of Suomenlinna – a World Heritage Site popular with tourists. Six heritage-listed buildings constructed in the 19th century during the period of Russian rule occupy most of the island. Several of these were recently converted to provide a cafe, restaurant and events space, with the sauna added at the southeastern tip. A short boat trip from one of the city's harbours transports visitors to the island, which looks out across the water towards the archipelago and is a nesting site for swans, geese and seabirds. 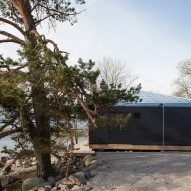 "Offering people a way to relax and enjoy the nature and the sea, […] the Lonna Sauna is part of the unique environment of the island where the man-made meets the natural and enters into dialogue with it," said the architects. The 190-square-metre building has a scale and form that complements the existing buildings on the island, with an asymmetric hipped roof clad in zinc plate referencing the gabled military structures. Materials used in the sauna's construction include brick and rough-hewn timber beams. The wooden walls were built using traditional joinery techniques and are left untreated. "Furnished with wood-burning stoves, it recreates the calm and almost sacred feeling of the traditional Finnish sauna, while placing it in a new, contemporary architectural frame," said the architects. 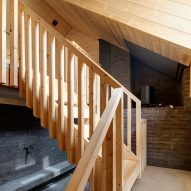 Larch boards are used to clad some of the internal surfaces and to create fitted furniture that extends the natural theme. Dormer windows projecting from the zinc-clad roof frame views of the water from a pair of elevated saunas for men and women. 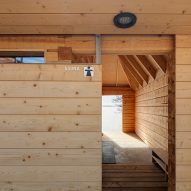 A stepped wooden terrace that extends towards the shore is accessible from the sauna rooms and from open passages stretching from the front to the rear of the building. Changing areas with woven baskets for storing clothes are accommodated behind the sauna areas, with bathrooms situated beneath the lower part of the roof. OOPEAA said the project is part of a wider trend that is seeing public saunas regain popularity throughout Finland. Helsinki is also home to a faceted wooden sauna building that visitors can climb upon to enjoy a view of the waterfront. In Sweden, public saunas are also experiencing an upsurge in popularity. Recent examples have included golden, egg-shaped sauna in a former mining town, and an industrial sauna clad in corrugated metal to reflect its harbour setting. The Finnish studio's other projects include a chapel clad in shimmering, multi-tonal copper panels, and a lakeside observation tower that functions as a periscope so visitors can experience the view from the bottom as well as the top.